Wishing you a very happy Christmas Kylie - may it be full of joy and laughs and charm - just like you and your blog! Hope you have a great xmas Kylie, I wonder if my card reached you In time, hopefully you'll get it soon :)! *That* explains what has happened to our Christmas tree this year. And there I was blaming my brother's visiting kitten... Have a great Christmas, Kylie - and here's to plenty of blogging mojo in 2014! 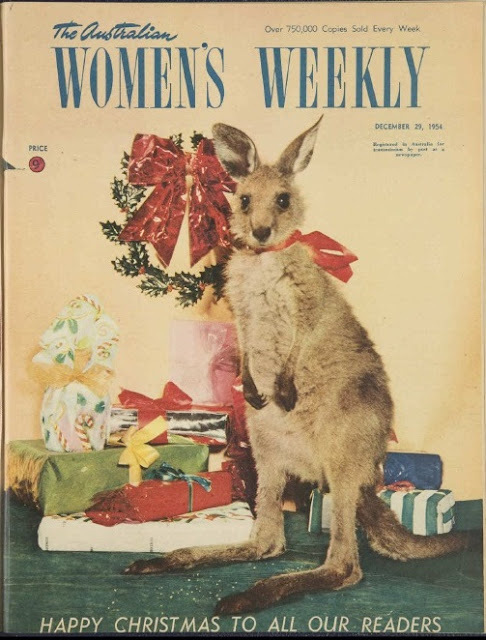 Nothing say Christmas like a 1950s kangaroo, does it?! glad to catch you here. superb vintage illustration, er, image. I'll have to show this post to my grandsons. They'll think the kangaroo is the cutest thing ever! Merry Christmas and Happy New Year from my family to yours, Kylie! Look at that little kangaroo...I am not convinced he is having a particularly happy Christmas! Mum and Dad were both born in 1954, a little trivia for you. That is a great cover. Aww such a lovely cover, what a find. Best wishes for Christmas to you Kylie and Anthony and your two gorgeous girls, have a wonderful New Years as well.